It’s not just Washington that shapes U.S. relations with the region; ties at the state level have long been key as well. Asia’s relations with the United States are shaped by U.S. presidents such as Richard Nixon and Barack Obama, but America’s governors also influenced political linkages and economic partnerships. This is illustrated by the recent meeting of Chinese president Xi Jinping with California governor Jerry Brown as well as his meetings with three governors in Beijing earlier this year. But these types of activities are not new. U.S. states’ leaders have been involved on economic, cultural, and political fronts with the Asia-Pacific region for over fifty years. Since the 1960s, governors have traveled to recruit foreign direct investment (FDI) in Asia and pursue trade opportunities; opened many offices abroad (beginning with New York creating a Tokyo office in 1963); set up transnational associations with political and business leaders such as the Midwest U.S.-Japan Association and Southeast U.S.-Japan Association; hosted visits from Asian officials; and lobbied policymakers in Washington, D.C. and occasionally commented openly on foreign relations issues. Governors from the American South first sought to build a relationship with Asia. James Cobb wrote, “By the 1970s European and Japanese industrialists were almost as likely to be contacted by southern development agencies as were their counterparts in the United States.” One of these internationally oriented governors was Jimmy Carter. Reflecting on his time as governor of Georgia while serving as U.S. president, Carter said, “I probably devoted 25 percent of my time to either recruiting investments in Georgia from other States in the Nation and also from overseas, or trying to sell Georgia products to foreign countries.” Altogether, during his time as governor Carter visited ten nations and established overseas offices, including one in Japan. Southern governors of the 1950s and 1960s were encouraged to look abroad for investment for two reasons: first, they had already recruited many businesses from more industrialized areas in the United States and second, foreign business leaders were less biased against the South and its socioeconomic problems. Former governors also told me that foreign business leaders were encouraged by financial incentives such as lower tax rates, descriptions of citizens’ strong work ethic, and training programs set up by technical colleges. Several scholars have explained how some governors’ efforts recruit FDI from Asia were transformational for their state’s economy. This includes Ohio’s Jim Rhodes recruitment of Honda in the 1970s, and Lamar Alexander’s many visits to Japan to lure Nissan to Tennessee in the 1980s. Kentucky’s Martha Layne Collins visited Japan eight times before convincing Toyota to build its first major investment in North America. Toyota would end up creating 3,500 jobs in Kentucky before Collins left office in 1987, and has since added thousands of more jobs. With a formalized business culture, former governors tell me that they seem to be particularly needed in Asia. While FDI attraction was the primary goal of some governors, others concentrated on export promotion. 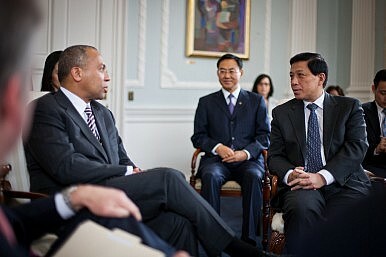 For example, the American state of Washington’s trade connections to the Pacific Rim are due to the aggressive global agendas of governors Booth Gardner, Mike Lowry, Gary Locke (later U.S. secretary of commerce and currently ambassador to China), and Christine Gregoire.